Home › Home News › Meet the inspiring future leaders of Peru! MMI’s International Program Officer, Sophie Jenkins, is currently visiting our programs in Peru. 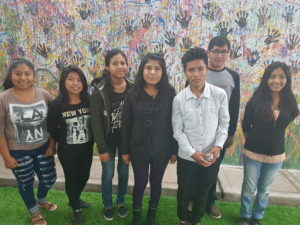 Last week, Sophie met these inspiring future leaders of Peru, pictured in front of the mural they painted to campaign against violence in their schools and their community. With the support of MMI and our partner CEOP Ilo, these students have established Peace Committees in their schools, offering peer mentoring services while campaigning against violence through drama, radio and even the odd flash-mob! This vital project demonstrates the valuable role young people can have in creating positive change in their communities. For more information about MMI’s School Peace Program click here.